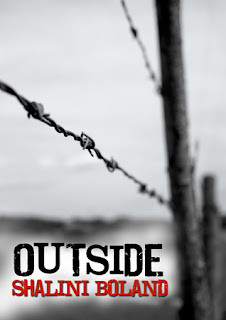 Book One in The Outside Series. She forsakes her own safety to go in search of the killer. Luc decides to go with her otherwise she’ll be dead before she’s past the security gate. But what awaits her outside is more unbelievable that she ever imagined. This was a good solid book. This is an interesting take on what happens after the world ends. The main story follows a young lady named Riley and Luc, her neighbor/love interest, as they venture outside their secure protected compound to search for a man they think killed her younger sister. The characters are well written. The character of Luc was the most lacking depth wise. I really get no feeling about him. Does he like Riley back? Well, obviously, he does because he risks his life in the dangerous outside world to go on a wild goose chase. That is the only evidence the author gives us into his feelings prior to his actual declaration. She never has him give Riley a second look until then. Riley does a bit too whinning for my taste. She shows some promise in the begining but just utterly wimps out in the middle of the book. In the end she shows us that brave tough side again. The best part of the book is the author’s description of the outside. It is utterly realistic. She describes my worst nightmare of modern society at its end. Well maybe not worst there are no Zombies. Riley and Luc encounter some pretty scary bandits. They also meet a seeming “nice” couple who lost their children to an alternative religion (aka cult). They encounter the cult and stumble into an even worse situation with remanants of the army. I was pretty amazed that a 17 yr old boy and 16 yr old girl could outwit so many adult do badders. The author then casually mentions that all children in the compound are trained in self defense and the use of weapons. Ok, I get that, it makes sense. It just would have been nice if we had seen that in earlier chapters. Throughout the novel the author throws in random chapters about a young woman named Elenor. These are flashbacks to the terrorist bombings that ended the world and the days that led up to them. At first these flashbacks are a bit jarring and confusing. Mid way they start to make sense and started to flow with the other timeline. I actually started looking forward to these little chapters. The author threw little clues in them that help the reader figure out Riley’s families past and what her sisters suspected murderer really means to her.